Buffalo BBQ Shrimp recipe is easy to make yielding fantastic results. Give it a try with our new Buffalo Cheese Wing Sauce. If possible, buy shrimp the day you plan to cook them. Frozen and thawed shrimp come without their heads, fresh shrimp with their heads on. Shells may be gray-green, pinkish, or brown, depending on the variety and where the shrimp were caught. Shrimp thaw very quickly. If their aroma has turned to the odor of ammonia return them and ask for a just-thawed bunch. For grilling, buy big shrimp, at least jumbo size. Expect 12 to 15 jumbo shrimp per pound and about 10 colossal. Shrimp usually are sold by number and weight. The smaller the number, the larger the shrimp, keep that in mind when selecting your shrimp. Smaller shrimp are difficult to handle over fire because they’re apt to slip through the rack or the grilling basket, and they’re hard to turn with long-handled tongs. 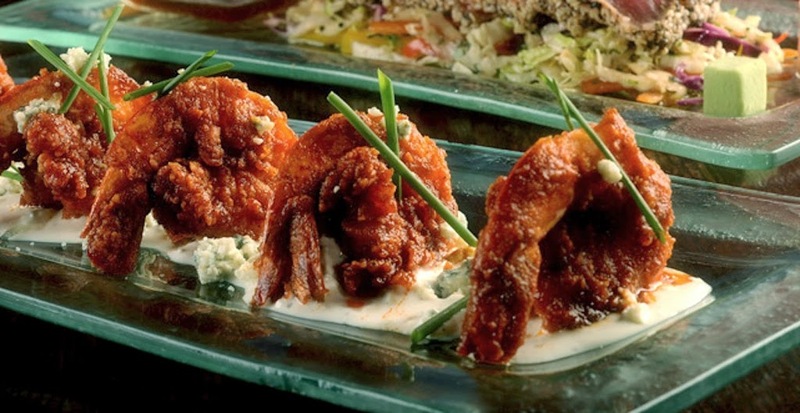 Many recipes call for de-veining shrimp. This refers to the large vein or sand track that is located along the back of all shrimp but is particularly visible in large and jumbo shrimp. It’s not always necessary to remove the vein, but if it contains sand it will be gritty. If you can’t see the vein, it’s clean. One simple way to clean shrimp is to remove the shell and place the shrimp under a batch of cold water. Do this by getting a large bowl filling it with cold water and ice. Take a shrimp in one hand and a knife in the other. Submerge both so that you de-vein under the water. Doing it this way keeps the vein in tact and keeps the shrimp cold while handling. 4. Ready to Grill. Arrange shrimp in a grilling basket or thread them on skewers and place on the grill 3 to 4 inches above a moderately hot fire. Brush the shrimp lightly with oil if not marinated, and cook until pink. Turn and grill on the other side. Allow 5 to 7 minutes total cooking time, half on each side. When done, the shrimp will be pink and the flesh opaque white. To check the shrimp for to ensure they are done, taste one. Overcooking toughens shrimp and robs them of flavor. To prevent shrimp from slipping through the rack on a grill, use an oiled grill basket that hinges open and latches shut. The same basket can be used for burgers, buns and other foods. As an alternative, thread shrimp on bamboo skewers that have been well soaked in water. Using only 2 shrimp per skewer leaves enough of a handle for turning the shrimp and removing them from the grill. Jumbo shrimp can be butterflied for the grill. Shell and de-vein them, leaving the tail intact. Then using a sharp knife, slice them along the back, but not all the way through. Spread them flat. Empty enough Buffalo Wing Cheese Sauce in the bowl to cover the cooked shrimp. Toss the shrimp in the sauce until the shrimp in covered. Plate the shrimp on a warm plate. *The Buffalo Cheese Wing Sauce delivers a savory Louisiana Red Pepper Sauce combined with Parmesan and Blue Cheese flavors.